My daughter had the day off on Friday, and this meant I had a little more time in my usually-hurried-and-stressed-out morning. Most weekdays, but especially on Tuesday when both kids need lunches, I often feel as though I am juggling pans, lunch boxes, chickens, dogs and my own needs under Jupiter-gravity conditions. On Friday, however, I leisurely set the alarm for a 45-minute meditation. I could have found, all too easily, other chores in the house that needed attention, but I forcibly subdued the urge to get one more thing off my list. Don’t Just Do Something, Sit there, is the humorous title of one of Sylvia Boorstein’s meditation-instruction books. I made the conscious choice to just sit there and not do. 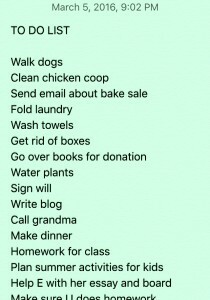 Perhaps the meditation had worked it’s magic and my mind was clear enough to see this, but as I breathed in and out, the realization struck me like lightning: No matter how much I work on my to-do list, it will never be completely done. There will always be more items that can be added to it. 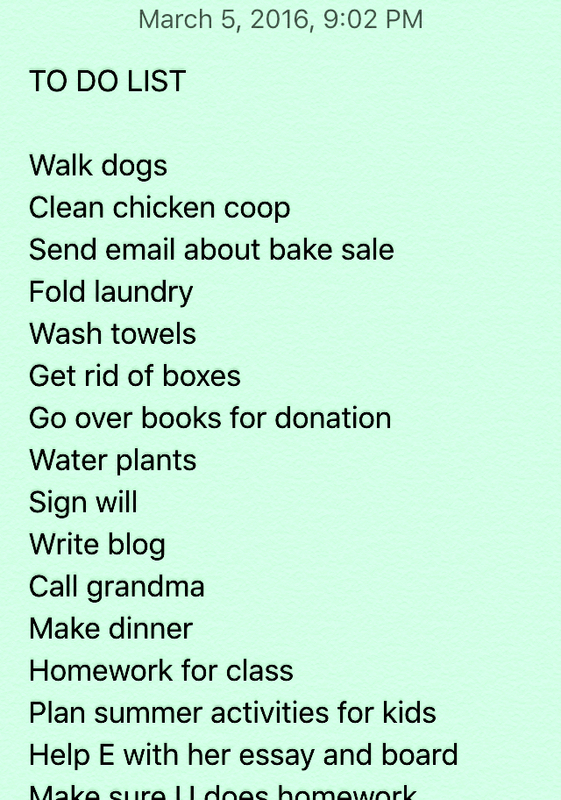 Whether it is small daily tasks like walking the dogs, cleaning the chicken coop, and unloading the dishwasher, or larger one-time tasks like coordinating the 7th grade bake sale or finishing my Bridge to Emergency Medical Responder class, the to-do list will never, ever stand on zero items. Never. So why do I expect myself to get it all done? When people die, I often hear relatives speak about the unfinished business the deceased had left behind. Some times it’s a messy house which the children need to clean up, pack up and dispose of. Some times it’s the details of the burial or the inheritance. I too, if I died today, will have died before signing my new will, which I’d been postponing for about a year now (though it is ready and waiting for me to sign). I wonder, though: does anyone ever die with all their business done, all the bills paid off, all documents settled, all chores completed, every single loose end tied? This past week felt very stressful to me. Hassled and harassed, no matter how much I did, there was always more to be done. Like a clown trying to keep all the juggling balls in the air, I strove to extend my arms so I could reach all the chores at once. There may be times, I suppose, when it really is necessary to juggle more than one task at a time. Often, however, I wonder what is making me feel this desperate-and-all-encompassing need to “get things done.” What will happen if some balls/tasks were never picked up? What would happen if I picked some up and then dropped them? What would happen if someone else picked up a ball that I dropped? Will these be the big disasters I expect? Labor as a religion. Get it? If getting things done is akin to religious dogma, small wonder that I struggle so much with how much I get done. If I believe in the absolute truth of Doing, then even my just sitting there in meditation must show concrete results and consequences. Rest is dangerous. A nap is mortal sin. Letting someone else do my job is opening the door to the devil and all his brood. And after all these words that I’ve just piled, I realize only three matter in the end: compassion and non-judgement. These words offer not a solution, but a truce of sorts: Can I be with the pain of the conflict between how I’ve been raised and how I choose to live my life without judging myself? Can I look on with compassion at all the tasks still gobbling up the space on the to-do list? And when I cannot take better care of myself in the midst of all these judgements and tasks, can I at least be compassionate for and not judge that? 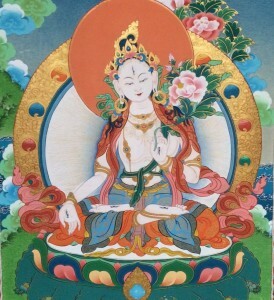 White Tara, the goddess of compassion. 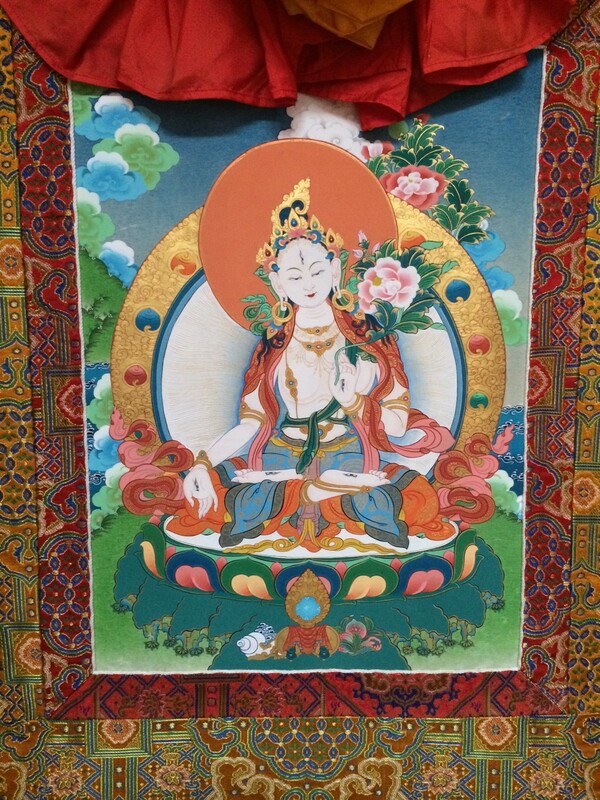 This exploration of my relationship to Doing is inspired by the class “A Year to Live” which I am taking at Against the Stream Buddhist Meditation Society in SF.